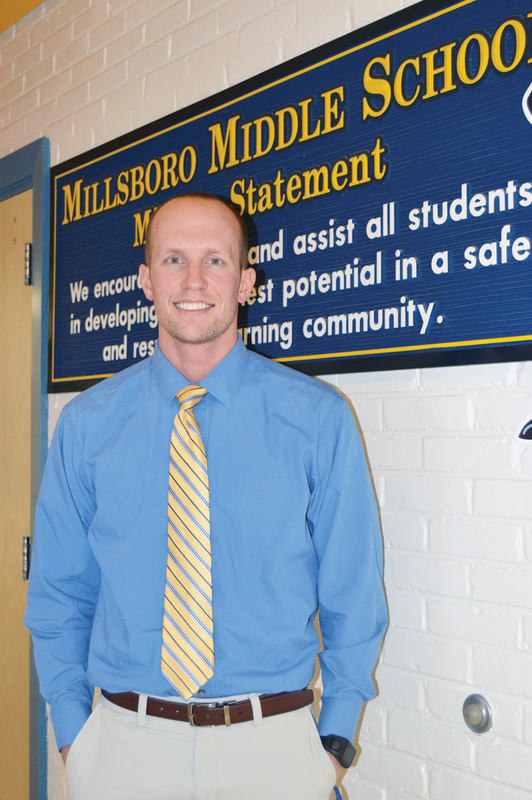 Richard Syphard has teaching in his blood — and now he is the Millsboro Middle School Teacher of the Year. Sounds like an average day’s news coverage, right? Well, yes. But it’s also an average day in Richard Syphard’s seventh-grade social studies class at Millsboro Middle School. Syphard — Millsboro Middle’s Teacher of the Year — was also one of three finalists for Indian River School District 2018 Teacher of the Year. A 2012 graduate of the University of Delaware and a Sussex County native, he has been teaching in his old stomping grounds for six years. Syphard attended Lord Baltimore Elementary School, then Southern Delaware School of the Arts, and graduated in 2008 from Sussex Technical High School. Not only is the area familiar, but the career path is one that Syphard figures is in his blood. His father, John Syphard, is now retired but taught at Southern Delaware School of the Arts and Indian River High School for many years. At U.D., Syphard studied social studies education with a concentration in history. He said he felt a connection with his college history professors; their curiosity about the world resonated with him. “The social studies professors, the history professors, were always the most interesting to me. They’re always characters, and I like that,” Syphard said. The intersection of social studies and seventh grade, he said, makes his job particularly satisfying. Syphard works each day to engage his students in the world around them, to get them thinking about a whole world of topics. The final project is a portfolio that contains contact information for government officials, as well as possible solutions to problems they have identified. “There’s something really satisfying about having a rambunctious energetic class under control,” Syphard said. With classes of about 35 students, he said, it makes for interesting times. “It’s really awesome to see 12-year-olds having academic conversations about civic participation and culture and societies,” he said. “Social studies allows me to present a problem and allow them to work it out. He said the give-and-take between teacher and students that he saw in his father’s classrooms while he was growing up was a catalyst toward his own career choice. “I guess I’m a chip off the old block,” he said. Syphard is about to begin pursuit of a doctorate in educational leadership, with an emphasis on district-level leadership, through Wilmington University. But he is already a leader in his building. As a team leader, Syphard helps make instructional decisions for the school and plans schoolwide events with the other team leaders. Technology and data analysis is also something he enjoys and feels he can contribute to his school. “I’d like to also think that I’m the one they can come to for … technology things. For my team, I try to do a lot of the data analysis,” which includes behavioral-academic data, as well as test-score analysis. Looking at standardized test scores helps determine what areas specific students need extra help in, as well as “why they’re not growing” throughout the year, he said. In addition to the obvious influence from his father, Syphard said he found inspiration during his practicum at Christiana High School. He also said he learned some out-of-the-box teaching techniques from teachers he met from other parts of the world through his father’s work as founder of the SDSA steel drum band. Social studies has been such an important part of Syphard’s life that it actually brought him together with his wife, Kayla. She is a social studies teacher at Georgetown Middle School. Having been in the same social studies classes, “We realized we were on a similar track, and that’s where we hit it off,” he said. This summer, Syphard will also be back on the lifeguard stand at Ocean Village, as he’s been for the past 10 years.